Audi's dinky A1 gets a 1.0-litre engine. Jonathan Crouch reports. 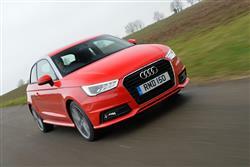 The Audi A1 has been treated to a clever downsized 1.0-litre engine. This develops 95PS and returns better than 65mpg. You can choose it with either a standard five-speed manual gearbox or, if you want to pay another £1,600, a seven-speed DSG twin-clutch. Prices start at just over £14,000. Many car makers get a bit jittery when extending their brands upwards. You've only got to look at Hyundai's faltering attempts for their big cars to be taken seriously and Skoda's hard-won bid for credibility as a quality manufacturer. The thing is, the same often happens when a prestige car manufacturer attempts to bring us a cheaper car. Porsche still hasn't quite got over the 924, Aston Martin made a complete pig's ear of the Cygnet and Mercedes took an eternity to get the A-Class right. Audi had issues too. Its aluminium-bodied A2 was a fantastic thing that nobody bought. Its successor, the A1, learns from those mistakes and is, in effect, a rebodied Volkswagen Polo. It's been a huge success though, sprinkling just enough of that Audi fairy dust on the smaller platform and it might just be at its most appealing with a tiny 1.0-litre engine plumbed under the bonnet. Audi tend to pride themselves on developing innovative technology and bringing it rapidly to market. BMW are still smarting from the fact that Audi beat them to the punch with laser headlights but maybe Ingolstadt took its eye off the ball when it came to downsized engines. It's been making up for lost time of late, and the 1.0-litre three-cylinder petrol engine here develops a punchy 95PS, and replaces the underwhelming 89PS 1.2-litre TFSI unit. Customers get a five-speed manual transmission as standard, and there's also the option of a seven-speed S tronic twin-clutch automatic transmission if you prefer to give your left leg a break in city traffic. Specify the S tronic box and it'll get to 62mph in a respectable 10.5 seconds before running onto a maximum of 119mph. Audi has upgraded the steering in the latest A1, the electromechanical system delivering a more faithful level of speed-sensitive assistance. Both the steering and the optional suspension with adjustable damping are controllable via the Audi drive select adaptive dynamics system, which is now a standard feature for A1 Sport model. It allows the driver to vary the weighting or the damping characteristics across three modes - auto, dynamic and efficiency - and it can also adjust the operating parameters of the engine and the S tronic transmission, where this is fitted. There's also a new suspension option including adjustable dampers available for Sport models. Prices open at £14,315 for the three-door 1.0-litre in SE trim with the Sport setting you back £16,290. The SE gets a decent run at the standard equipment list, featuring alloy wheels, remote central locking, air conditioning, electric front windows and mirrors and a six-speaker single CD audio system with auxiliary iPod connection linked to a 6.5-inch retractable display. A secondary collision brake assist system also now joins this list for the latest range, which can initiate automatic braking to reduce the risks of skidding and additional collisions during an accident. The Sport models now include Audi drive select plus the Audi Music Interface and preparation for SD card-based navigation, and already featured upgrades such as larger 16-inch wheels, sports suspension, sports seats, Bluetooth mobile phone preparation and a Driver's Information System. Key rivals include the MINI One and Fiat's 500. The 1.0-litre engine clearly betters its 1.2-litre predecessor both in terms of power, flexibility and efficiency. Whereas you'd have got 55mpg and 118g/km from the 1.2-litre lump, which aren't bad figures, the 1.0-litre promises far better. Fuel economy is pegged at 65.7mpg with emissions just dipping under the crucial 100g/km barrier. There has been some controversy surrounding the 0.9-litre and 1.0-litre downsized engines from Fiat and Ford respectively concerning their real world versus published economy figures but the Audi does turn in some reasonable numbers when driving modestly. The long gearing might not help with acceleration but is a boon on longer journeys. On urban trips the standard stop/start system helps economy although the thrum of the three-cylinder engine on restart isn't exactly imperceptible. The evolutionary styling of this mildly facelifted model isn't going to send residuals of older A1s swirling down the gurgler, which will come as some relief if you're an existing owner, and should help protect the value of your trade in if you fancied chopping it in against a new version. So, can less really be more? In this case, yes. The Audi A1 1.0-litre TFSI is a comprehensively better car than the 1.2-litre model it replaces. The latest updates to the A1 range don't change it too much but the engine certainly does. We reckon it's the best of the crop of these downsized litre lumps and although it's not what you'd call zippy, there's decent refinement and running costs are minuscule. Even for an Audi. Unless you're dead set on the turbocharged wallop of an S1, this 1.0-litre engine is the best fit for an A1. It's nicer to drive than any of the turbodiesels, it's keenly priced and it just seems to suit the A1 platform. Even the notion of having a 1.0-litre engine in an A1 has a pleasant symmetry about it. There's also something quite warming about the fact that here is a genuinely likeable Audi that you can buy new, with warranty from just over £14,000. If you want a supermini that's a cut above, this is really all you need.